Gebo and the Shadow (2012). I’m a little late catching up with our viewings at the Vancouver International Film Festival this year (it ended on the 11th), but I did want to signal some of the best things we didn’t squeeze into earlier entries. Kristin and I also want to pay tribute to one of the biggest moving forces behind the event. Like Father, Like Son (2013). Among other goals, film festivals aim to provide a safe space for nonconformist filmmaking. Programmers need to find the next new thing—art cinema is as driven by novelty as Hollywood is—and they encourage films that push boundaries. What isn’t so often recognized is that sometimes festivals show filmmakers who were once quite artistically daring backing off a bit from their more radical impulses. Part of this is probably age and maturity; part of it reflects the fact that apart from daring novelties, festivals also showcase works that might cross over to wider audiences. And of course festivals will present recent works by the most distinguished filmmakers, almost regardless of the programmers’ hunches about their quality. Some sectors of the audience want to see the latest Hou or Kiarostami or Assayas. Koreeda Hirokazu was thirty-three when Mabarosi (1995) won a prize at Venice. It’s an austerely beautiful work, presenting a disquieting family drama in very long, static takes. 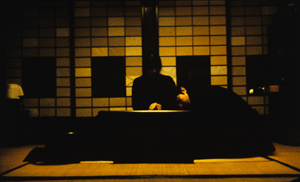 Once the action shifts to a seacoast village, distant shots render slowly-changing illumination playing over landscapes, while the tension between husband and wife is built out of small gestures. For example, we learn that the forlorn wife is waiting in the bus stop only when a little bit of her comes to light. Lest this seem just fancy playing around, Koreeda occasionally used his long takes to build suspense. Yumiko’s new husband has been drinking. While he’s out of the room, she opens a drawer to retrieve the bike bell she keeps in memory of her first husband, killed in a traffic accident. The second husband returns unexpectedly, and drunkenly collapses on the table beside her. But when she lifts her hands out of her lap, she inadvertently lets the bell tinkle a little. The sound rouses him and he asks what she’s holding. She raises her head at last and they begin a quarrel about each one’s motives in marrying the other. Eventually he will shift woozily to the other side of the table and notice what has been sitting quietly in the frame all along: the still-open drawer on the far right. In later films, from After Life (1998) to I Wish (2011), Koreeda’s visual design became less reliant on just-noticeable changes within a placid shot. The images have become less demanding, and more extroverted narrative lines carry stronger sentiment. The films remain admirable in their ingenious plotting and mixture of humor and pathos—which is to say, they are committed to that “cinema of quality” that makes movies exportable. That commitment is firmly in place in Like Father, Like Son. Koreeda, now fifty-one, dares almost nothing stylistically or narratively. Yet every scene leaves a discernible tang of emotion, and his light touch assures that things never lapse into histrionics. If Nobody Knows (2004) and I Wish (2011) are his “children films,” this is, like Still Walking (2008), a movie about being a parent. The plot has a fairy-tale premise: Babies switched at birth. Our viewpoint is aligned with the well-to-do parents and particularly the ambitious executive Ryota. When he finds that six-year-old Keita isn’t his birth son, he insists on swapping the boy into the household of the happy-go-lucky working-class Saiki family. In exchange, Ryota and his wife take in the boy that Saikis have raised as their own. As the film proceeds, our view widens to create a welter of comparisons—two ways of being six years old, tough discipline versus easygoing parenting, what rich people take for granted and what poor people can’t, a solicitous mother versus one who can’t spare time for coddling. Koreeda is faultless in measuring the reactions of all involved. Ryota’s wife slips into quiet depression. Saiki is an affable father with a childish streak, but he also looks forward to suing the hospital. Saiki’s wife, a no-nonsense woman with two other kids to care for, is a mixture of toughness and maternal affection. As in a Renoir film, everyone has his reasons, and the drama depends on a process of adjustment stretching across many months. Climaxes become muted, though no less powerful for that. A smile and a tear: the Shochiku studio formula, enunciated by Kido Shiro back in the 1920s, remains in force here. Simple motifs, such as images stored on a camera’s photo card, hark back to all those affectionate picture-taking scenes in Ozu’s classics. The whole is shot with a conventional polish—coverage through long lenses, straightforward scene dissection—that’s far from the strict, slightly chilly look of Maborosi. It’s impossible to dislike this warm, meticulously carpentered film. Koreeda has proven himself a master of humanistic filmmaking, and I admire what he’s done (as these entries indicate). Those of us who’ve been following his career for nearly twenty years, however, may feel a little disappointed that he hasn’t tried to stretch his horizons a bit more. Like Father, Like Son was rewarded with the Jury Prize at this year’s Cannes festival. Steven Spielberg, jury president, has acquired remake rights for DreamWorks. A Touch of Sin (2013). Jia Zhang-ke’s A Touch of Sin offers a comparable adjustment to broader tastes. It’s far less forbidding than his early features Platform (2000), Unknown Pleasures (2002), and The World (2004). 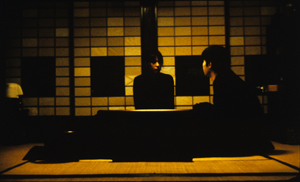 Somewhat like Koreeda, Jia’s earliest fiction films embraced a long-take aesthetic that tended to keep the characters’ situations framed in a broad context. (His documentaries, like the remarkable 2001 In Public, were somewhat different.) 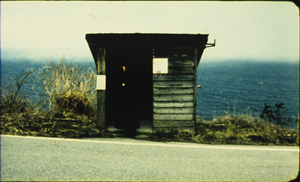 Jia proceeded to breach the boundary between documentary and fiction in Still Life (2007), Useless (2007), and 24 City (2008). With A Touch of Sin, Jia takes on a twisting, violent network narrative that is as shocking as Koreeda’s duplex story is ingratiating. We start with a villager who fumes at the corruption in his town and carries out a vendetta against its rulers. Another story centers on a receptionist who is taken for a prostitute and abused by massage-parlor customers. A third protagonist is an uneducated young man floating among factory jobs who turns his frustration inward. Threading through these is a drifter who shoots muggers from his motorcycle and later takes up purse-snatching. Like Koreeda, Jia has had recourse to some of the casual long-lens coverage we find in many contemporary movies, but certain shots gather weight through his signature long takes–especially shots holding on brooding characters. In all, we get a dread-filled panorama, with bursts of violence staged and filmed with an impact that reminds you how sanitized contemporary action scenes are. For more, see Manohla Dargis’ rich Times review of the film. After the painstaking (and pain-giving) dynamics of Drug War (our entry is here), one of Johnnie To Kei-fung’s best recent films, it’s wholly typical that he does something outrageous. His work with Wai Ka-fai at their Milkyway company has always alternated unforgiving crime films of rarefied tenor with sweet and wacko romantic comedies that assure solid returns. But seldom have they combined the two tendencies into something as screechingly peculiar as The Blind Detective. Initially the investigator, inexplicably named Johnston, seems to be a brother to Bun, the mad detective of To and Wai’s 2007 film. He insists on having the crime reenacted so as to intuit the perp’s identity. But since Johnston is blind, somebody else must tumble down stairs, get whacked on the head, and generally suffer severe pain in the name of the law. Ready to sacrifice herself to Johnston’s mission is officer Ho, a spry and game young woman with a crush on him. Johnston and Ho are trying to find what happened to a schoolgirl who went missing ten years before. But this account makes the movie seem more linear than it is. Johnston makes his living from reward money, and he’s also dedicated to finding a dancing teacher he fell in love with when he had sight. So the search for Minnie is constantly deflected. Yet the digressions end up, mostly through Johnston’s inexplicable flashes of imagination, carrying them back to their main quest. This episodic plot, or rather two plots, stretched to 130 minutes (making this the longest Milkyway release, I believe), yields something like a Hong Kong comedy of the 1980s, where slapstick, gore, and non-sequitur scenes are stitched together by the flimsiest of pretexts. The tone careens from farce (not often very funny to Westerners) to grim salaciousness. Johnston’s intuitive leaps are represented by blue-tinted fantasies that show him gliding through a scene at the moment of the murder, or assembling a gaggle of victims to declaim their stories. Characters are ever on the verge of exploding in anger or aggression, and between the big scenes Ho and Johnston dance tangos and gnaw their way through steaks, fish, and other delicacies. Once more, the congenitally fabulous Andy Lau Tak-wah is accompanied by Sammi Cheng as his love interest, and the two ham it up as gleefully as in Love on a Diet (2001). (They were more subdued in my favorite of the cycle, Needing You…, 1999.) This is, in short, a real Hong Kong popular movie. It brought in US $2.0 million in the territory, and $33 million on the Mainland, about the same as Monsters University. If it keeps Milkyway in business, how can I object? For a discerning take on The Blind Detective, see Kozo’s review at LoveHKFilm. Kristin and I were keenly looking forward to 3 x 3D, the portmanteau film collecting stereoscopic shorts by Peter Greenaway, Edgar Pêra, and Jean-Luc Godard. Kristin found the Greenaway episode–sort of his version of Russian Ark, taking the camera through the labyrinth of a ducal palace and showing off elaborate digital effects–fairly appealing. But for us the Godard was the main attraction, and he didn’t disappoint. At one level, The Three Disasters reverts to his characteristic collage of found footage, film stills, scrawled overwriting, and insistent voice-over. (Is it my imagination or does the the 83-year-old filmmaker’s croak sound increasingly like that of Alpha 60?) The montage is sometimes over-explicit, as when Charlie Chaplin is juxtaposed with Hitler. There’s a funny passage of portraits of one-eyed directors (Lang, Ford, Ray), as if to reassert the primacy of classical monocular cinema. At other points, things get obscure, as when Eisenstein’s plea for Jewish causes during World War II is followed by shots from The Lady from Shanghai. But this is the Godard of Histoire(s) du cinema, piling up impressions that beg for acolytes to identify the images and find associations among them. Frankly, this side of Godard doesn’t grab me as much as his pseudo-, quasi-, more-or-less-narrative features. But in 3D his dispersive poetic musings take on a new vitality. 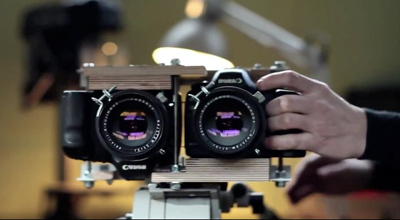 He doesn’t retrofit old movie clips and still photos for 3D. Instead he superimposes them, making one cloudy plane drift over another. He can also, more forcefully, present his signature numerals and intertitles in a new way–by having them pound out of the screen and hang rigidly in front of the image. There are also some 3D shots made specifically for the film, most consisting of handheld shots that shift around a park, a medical complex, and, of course, a media studio. 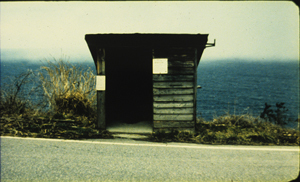 The very title of Godard’s film, punning on 3D as a technical disaster, as well as a throw of the dice (dés), suggests his ambivalence toward the technology. “The digital,” his voice declares, “will be a dictatorship,” but perhaps it will never abolish chance. Brian Clark has an informative review of The Three Disasters at twitchfilm. 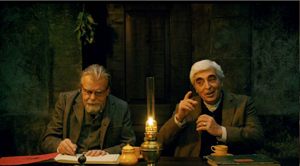 In nineteenth-century Portugal, the elderly Gebo ekes out a living as a company accountant. His wife Doroteia and his daughter-in-law Sofia wait with him for the return of João, a rebellious ne’er-do-well. Gebo feeds Doroteia’s illusions about their son, who has likely become an outlaw. When João returns after eight years away, he throws the family into turmoil and becomes fixated on the cash that his father safeguards for the firm. After World War II, André Bazin noticed that many filmmakers were starting to take a creative approach to adapting plays. Olivier’s Henry IV, Welles’ Macbeth and Othello, Dreyer’s Day of Wrath, Cocteau’s Les Parents terribles, Melville’s Les Enfants terribles, Hitchcock’s Rope, and Wyler’s Little Foxes and Detective Story, are far from the “photographed theatre” that some critics feared would dominate talking pictures. For decades Manoel de Oliveira has explored avenues of theatrical adaptation that have led us to some daring destinations. Gebo and the Shadow, drawn from a 1923 play by the Portuguese Raúl Brandão, is a powerful recent example, and possibly the best film I saw at VIFF this year. 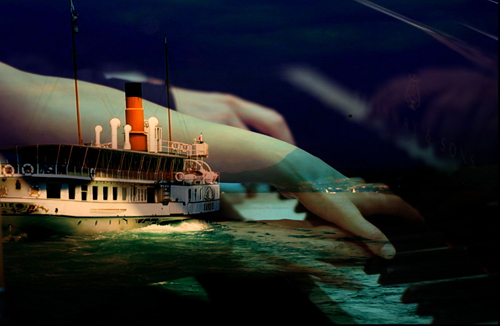 After the credits show João loitering on the docks, the film confines the action almost wholly to the parlor of Gebo’s family home. 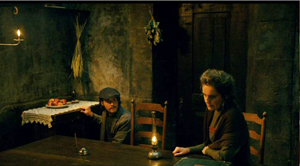 Early on we see the street outside through a window, but most of the film concentrates on the characters gathered around the room’s central table. On stage, we can imagine the table at the center and the major characters assembling around it but leaving one side clear, facing the audience–in effect, accepting the convention of the invisible fourth wall that gives us access to the space. As the still above suggests, it seems initially that Oliveira is playing up this convention, putting us into the stage space and setting the fourth wall behind us. Very soon, though, we’re inserted between the players, so that we see the other side of this lantern-lit playing space. For the most part, the first stretch of conversations and soliloquys among Gebo, Doroteia, and Sofia are played out in this planimetric, clothesline layout. So is the late-night arrival of the vagrant João, coming to sit opposite his father and laughing wildly. This shot corresponds to the end of the play’s first act. On the next day, when Gebo and his family receive some friends, the table is sliced in half. The effect is to redouble the sense of proscenium space, presenting two planimetric arrays that always keep one “behind” us. Like other chamber-plays-on-film (Dreyer’s Master of the House, Hitchcock’s Dial M for Murder), Gebo varies its spatial premises slightly to incorporate other possibilities. 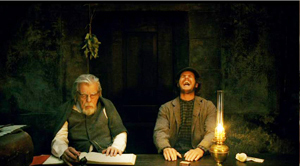 In the stretch corresponding to the second act of the play, the angle on the table changes twice, once to present the split table-scene above, and later, to the climactic moment when João joins Sofia and contemplates breaking open the strongbox. Sometimes we’re shown the window and other walls, usually presented when characters leave one shot and enter another. The constructive editing helps us tie together zones of the room that aren’t ever given in an all-encompassing master shot. And the camera never moves, not even to reframe characters’ gestures. In previous films, Oliveira has played with the ambiguities of who’s looking where. (See, for instance, Eccentricities of a Blonde-Hair Girl and The Strange Case of Angelica.) 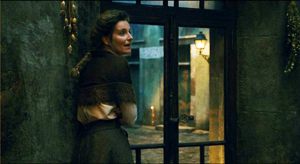 After a mysterious prologue involving João, a ravishing image presents Sofia watching at the window, then moving aside to reveal Doroteia behind her (and behind us). As often happens, the start of a film sets up an internal norm; it teaches us how to watch it. This movie starts with a lesson in optical geometry. Sofia watches the street, goes out to scan for Gebo’s arrival, then watches Doroteia from outside the window before coming back in and resuming her position at the window. 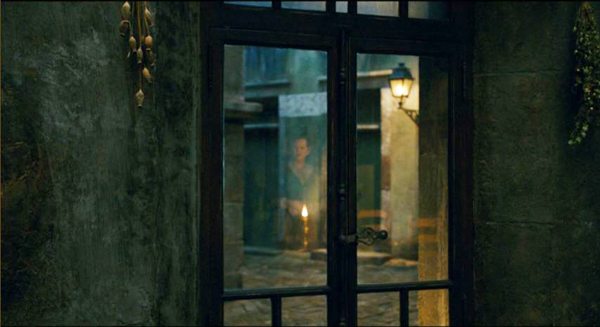 As the shot develops, we can see Doroteia lighting a lamp and reflected in the window against the distant doorway. When Sofia walks out of the shot, Oliveira’s camera lingers on the window, in which we can still see Doroteia turning her head to watch Sofia’s coming to her. This is the shot, imperfectly reproduced, that’s at the top of today’s entry. The image isn’t far from the gently insistent changes of Koreeda’s Maborosi. This film about a shadow starts with an image of a spectre. Constructive editing often relies on a glance offscreen, so here he can play with minute differences of eye direction. Occasionally the actors look directly out at us. But when the table is halved, as above, the eyelines get very oblique, with opposite characters looking in the same direction. In the third act, the frontal and planimetric grouping around the table returns. Gebo has searched fruitlessly for João and has returned to take the consequences of his son’s theft. 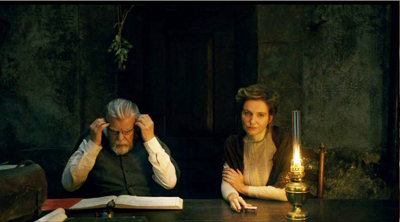 Oliveira’s adaptation omits the play’s fourth act, when the family is reunited three years later. His version leaves the family suspended in a freeze-frame, haunted by the ghostly son who has betrayed their trust. This dramatic climax is also a visual one, with sunlight for the first time spilling into the chilly, lamplit parlor and its inhabitants startled, as if they shared João’s guilt. Perhaps more than the other films in this entry, Jebo and the Shadow shows why we need film festivals. Oliveira’s purified experiment demands a lot from the audience, but it repays our efforts. It’s at once an engrossing story and an exciting exercise in what cinema can still do. Note as well that I have managed to get through a discussion of Oliveira’s film without mentioning his age. For more on the film, see Francisco Ferreira’s very helpful essay in Cinema Scope. 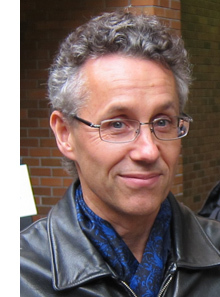 Finally, Alan Franey has announced his departure from the job of Director of the Vancouver International Film Festival. He’s going out on a high note. This year’s edition was a solid success, and its spread to venues around town seems to have brought a wider audience. For twenty-six years Alan has led the process of making the festival one of the best in North America. He has helped give it a unique identity as home to Canadian cinema, documentaries on the arts and the environment, and outstanding current Asian cinema. For Kristin and me, he has been a wonderful friend and good-humored company. Alan’s deep commitment to great cinema has shown in his recruitment of colleagues, his skilful defusing of potential crises (most recently the shift to digital projection), and his genial, almost Zen, good nature. Fortunately for the festival, he will remain as a programmer. He deserves our lasting thanks. Good news for US audiences on some of these titles: Sundance Selects will distribute Like Father, Like Son, while Kino Lorber has wisely acquired rights for A Touch of Sin. Gebo and the Shadow is available on an English-subtitled DVD from Fnac and Amazon.fr. It’s a very dark movie, and in order to make the frames readable here, I’ve had to brighten them a bit. These images don’t do justice to what I saw in the VIFF screening, or even to what the fairly decent DVD looks like. For more on planimetric staging of the sort we find in Gebo and Maborosi, see entries here and here and here. It’s a common resource of modern cinema, and directors utilize it in a variety of ways. This entry was posted on Monday | October 21, 2013 at 12:08 am	and is filed under Directors: Godard, Directors: Jia Zhang-ke, Directors: Johnnie To Kei-fung, Directors: Kore-eda Hirokazu, Directors: Oliveira, Festivals: Vancouver, Film technique: Staging. Responses are currently closed, but you can trackback from your own site.